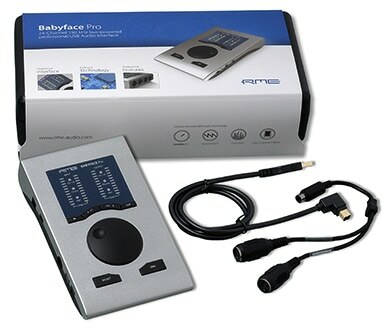 The exciting Babyface Pro once again demonstrates RME’s absolute commitment to superior craftsmanship, not only in audio circuits and driver development, but also in mechanics. For the main I/O RME have designed a completely new XLR socket, which integrates seamlessly into the housing and saves space. The two headphone outputs, offering TRS and mini-jack sockets in parallel, have completely separate driver stages to perfectly match low and high impedance headphones, guaranteeing pristine sonic results no matter what type of headphone is used. 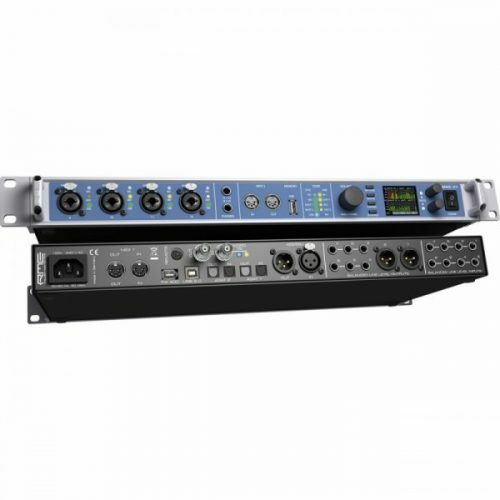 Two digitally controlled preamps provide individually switchable 48V phantom power. These brand new circuits feature a gain range of 76 dB, adjustable in steps of 1 dB, including a relay-driven PAD, resulting in exceptional EIN (Equivalent Input Noise) performance as well as line overload protection, and enough gain for even the lowest level microphones. Babyface Pro’s incredibly efficient design almost never requires an external power supply – it’s perfectly stable on USB 3 bus power, and also most USB 2 ports, with no degradation in any technical specification. 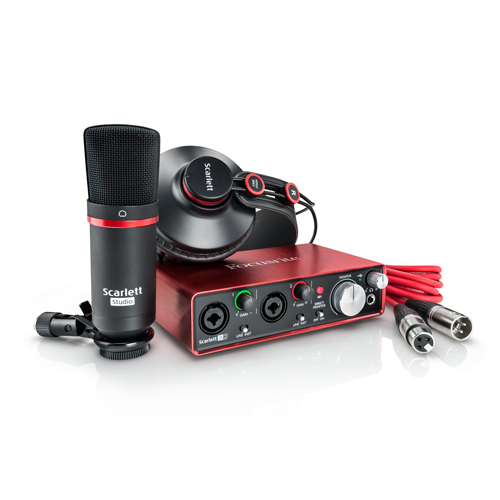 This makes it perfect for mobile recording, even with a pair of your favourite condenser microphones. 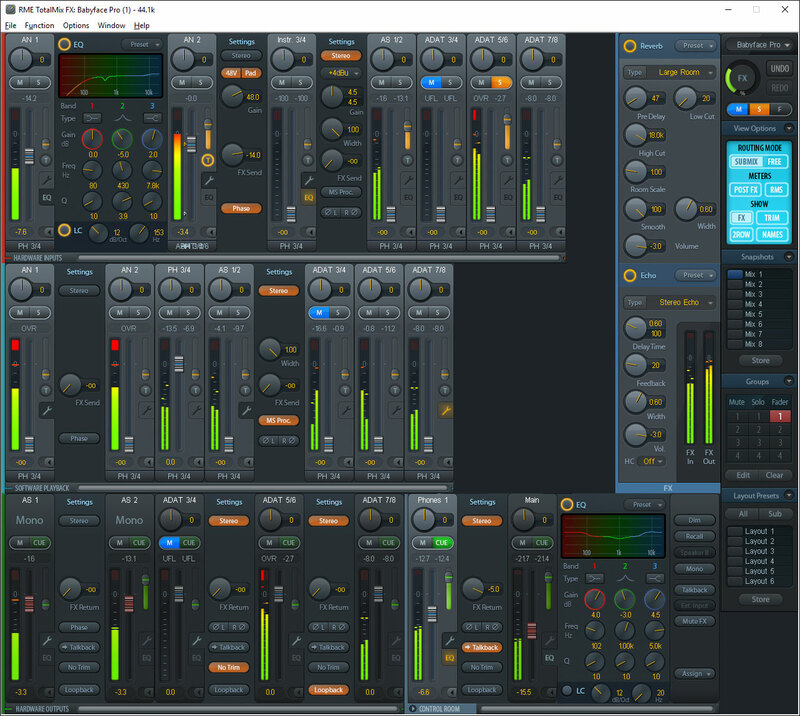 Babyface Pro ships with RME’s TotalMix FX, available for Windows and Mac OS X. An iOS version is available as well. This amazingly versatile software allows you to use Babyface Pro in any situation. For example mixing your guitar and vocals to headphones has never been easier. The FPGA-based DSP mixer adds a flexible, 3-band parametric equalizer to all inputs and outputs. Reverb and delay FX are also available. 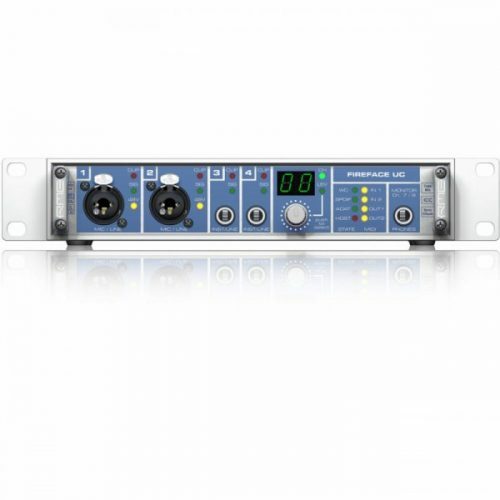 Latest generation low latency AD/DA converters, combined with RME’s unique SteadyClock technology, result in exceptional specifications that will satisfy the most demanding of professionals. 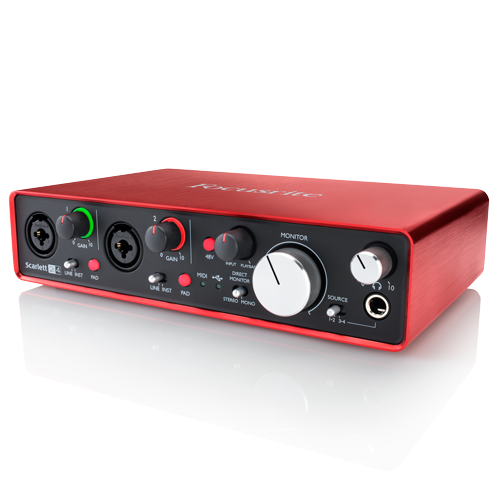 Combining a huge feature set with sonic excellence and intuitive control, whether for the studio or on the move, the RME Babyface Pro is the most comprehensive and versatile compact audio interface ever built. A field-programmable gate array (FPGA) is an integrated circuit designed to be configured by a customer or a designer after manufacturing. The Class Compliant mode is a standard that is natively supported by operating systems like Windows, Mac OS X, Linux distributions, and hardware like Apple’s iPad. No proprietary drivers are required, the device will be directly recognized. 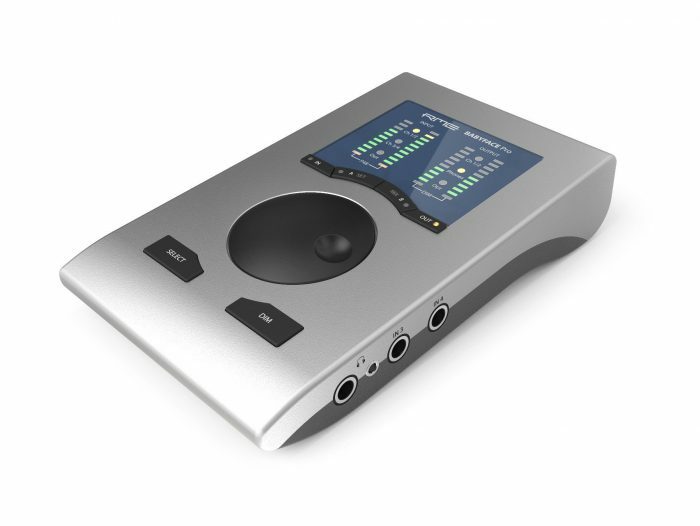 Due to the highly efficient jitter reduction, the converters operate as if they are working with internal clock all the time – guaranteeing a pristine sound experience! TotalMix FX is RME’s superior hardware mixer. 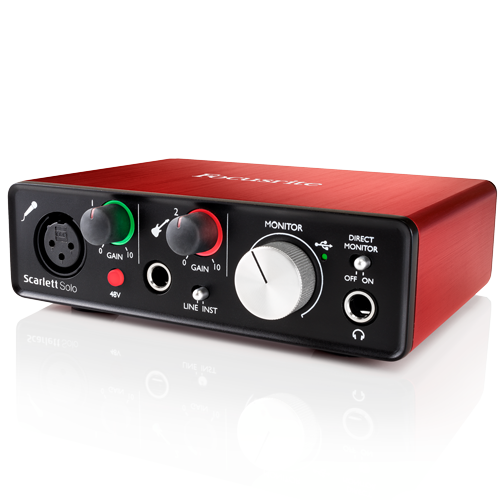 It delivers fully flexible mixing/routing with many superior features for studio and live work, still maintaining exemplary overview and usability. Straight to the core without interference: the reference design of the Babyface Pro leaves nothing to be desired. RME devices are designed to conserve music as it is. Audio signals are passed in their entirety, nothing added, nothing taken. For the new Babyface, the audio circuits have been improved to meet even highest gain levels with best dynamic range. The clever user interface is informative and clearly laid out. It makes access to every feature and configuration mode of the Babyface Pro intuitive and easy to use. Even in stand-alone mode, routing and mixing of inputs to outputs directly on the device opens a whole world of possible applications. The next generation of TotalMix delivers hardware mixing/routing with lots of new features and a highly improved usability. For a seamless integration of the new features TotalMix has been rewritten from the ground up. The DSP mixer now not only matches features of high-end digital consoles but even adds effects like a 3-band parametric EQ plus Low Cut on all input and output channels. The Babyface also provides a separate FX send bus for all inputs and software playback channels, feeding two effect engines: Reverb and Echo. Every output channel includes a FX return control for the FX output signal. Control Room Section: Dedicated section for the main output (e. g. studio monitors) and other monitoring outputs (e. g. phones). All existing stereo output channels can be freely assigned as source for the control room section channels. Trim mode: Adjusts the volume for all routed signals of a channel. This option allows to modify the volume of all sends of a channel simultaneously, equalling a hardware’s trim functionality. The DSP-based hardware calculates RMS and Peak levels for all channels without causing any CPU load.